Being SEC compliant, in and of itself, is not the same as being prepared for an SEC exam. Your goal should be a constant state of exam preparedness. The SEC can conduct an exam of a federally registered investment adviser at any time, for any reason. The worst time to try and prepare is between the notification of an exam and the examiners’ arrival at the door. Knowing what to expect and how to prepare will help you avoid panic when you receive that phone call or hear that knock on the door and will empower you to successfully manage the exam process once it is initiated. The Survival Guide will give you a sense of how prepared you are and help to identify any critical gaps in your compliance program, with tips, suggestions, and recommendations compiled from industry leaders as well as the SEC itself. 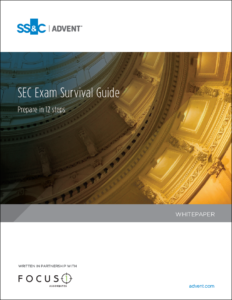 Simply complete the short form on this page to download your copy of the SEC Exam Survival Guide.